Just flipping through the inter-webs and found this image, didn't know what it was so started doing some research. 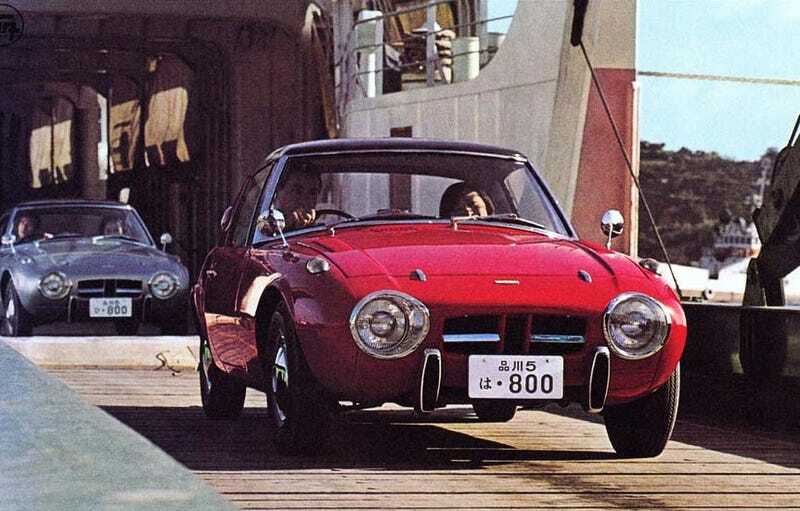 Built between 1965 and 1969, Toyota's first production Sports car, about 3100 were built(only 10% known to exist now), came with a 0.8 liter engine, 45hp and RWD. Two options were available the Coupe and Targa, incidentally first car with a targa top, Porsche offered the option a whole 2 years later. The car was designed by Shozo Sato on loan to Toyota by Datsun, Sato's other designs included the original Cedric 30 and 112. And going by how he used to do things, the 800 was probably drawn by hand using water colours. Extremely cool car, It looks like something that Alfa would build. Let me know if you have any more info on this.